This article is about a musical piece. For the actual flight of a bumblebee, see Bumblebee § Flight. 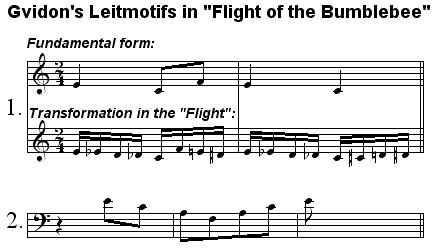 Although the "Flight" does not have a title in the score of the opera, its common English title translates like the Russian one (Полёт шмеля = Polyot shmelya). Incidentally, this piece does not constitute one of the movements of the orchestral suite that Rimsky-Korsakov derived from the opera for concerts. The music of this number recurs in modified form during the ensuing tableau (Act III, Tableau 2), at the points when the Bumblebee appears during the scene: it stings the two evil sisters on the brow, blinds Babarikha (the instigator of the plot to trick Saltan at the beginning into sending his wife away), and in general causes havoc at the end of the tableau. The readers of Alexander Pushkin's original poem, upon which this opera is based, will note that Gvidon is supposed to go on three separate trips to Saltan's kingdom, each of which requires a transformation into a different insect. "Flight of the Bumblebee" is recognizable for its frantic pace when played up to tempo, with nearly uninterrupted runs of chromatic sixteenth notes. It is not so much the pitch or range of the notes that are played that challenges the musician, but simply the musician's ability to move to them quickly enough. Because of this and its complexity, it requires a great deal of skill to perform. In the "Tsar Saltan" suite, the short version is commonly played, taking less than two minutes. In the Opera version, the three-minute fifty-five-second version is performed. Although the original orchestral version assigns portions of the sixteenth-note runs to various instruments in tandem, in the century since its composition the piece has become a standard showcase for solo instrumental virtuosity, whether on the original violin or on practically any other melodic instrument. Sergei Rachmaninov's transcription for piano features in the film Shine and is interpreted by David Helfgott. Big band trumpeter Harry James did a cover of the piece in 1941. "Flight of the Bumblebee" was featured, along with other compositions by Rimsky-Korsakov, in the fictional 1947 biopic Song of Scheherazade. A piano-based version by B. Bumble and the Stingers reached #21 on the Billboard Hot 100 in 1961. Japanese band Takeshi Terauchi & Bunnys recorded an instrumental rock cover of this song on their 1967 album, Let's Go Unmei. The song was featured in the first episode of The Muppet Show, in which Gonzo attempts to eat a tire on stage with the song playing in the background. During the episode of the Internet animated series Cyanide and Happiness "Ribs", the song is frequently played. The radio program The Green Hornet used "Flight of the Bumblebee" as its theme music, blended with a hornet buzz created on a theremin. The music became so strongly identified with the show and the character that it was retained as the theme for the later TV series. This version was orchestrated by Billy May and conducted by Lionel Newman, with trumpet solo by Al Hirt, in a jazz style nicknamed "Green Bee". This particular version was later featured in the 2003 film Kill Bill. Progressive metal band Protest The Hero references the main motif at the end of the song "Palms Read." Extreme's song "Flight of the Wounded Bumblebee" is named after the piece, although it is not based on it. Manowar bassist Joey DeMaio recorded a version titled "Sting of the Bumblebee," played entirely on bass guitar. Trans-Siberian Orchestra has included the piece into the song A Last Illusion on its Beethoven's Last Night album. The video game Rayman uses an altered version of the piece during a chase sequence in which the title character rides a mosquito. This version gradually increases in tempo. The Great Kat recorded a thrash metal version on her 1990 album Beethoven on Speed. It was often used on Glee when characters were about to get slushied. The music inspired Walt Disney to have a bumblebee featured in a segment of Fantasia that would sound as if it were flying around a movie theater. Although this did not appear in the final film, it anticipated the eventual invention of surround sound. However, in his film Melody Time, Disney included an animated segment using Freddy Martin's "Bumble Boogie", a jazz arrangement of the piece. In the comedy series Black Books (episode "Entertainer"), Manny learns to play the piano by accident, listening to the radio and pressing the keys purely on intuition. He explains that he "picked up this other thing, it is quite famous" and performs "Flight of the Bumblebee" among other difficult pieces. In a memorable scene of Scott Hicks's film "Shine" (1996), Geoffrey Rush's character David Helfgott wanders out of a rainy night into a cafe and amazes the few patrons there by playing a piano version of "Flight of the Bumblebee." ↑ Holman, Tomlinson (2007). Surround sound: up and running. Focal Press. pp. 3,4. ISBN 978-0-240-80829-1. Retrieved 2010-04-03. ↑ "(Italian version)". Youtube.com. February 27, 2009. Retrieved 2012-04-21. ↑ "(world record)". guinnessworldrecords.com. January 9, 2012. Retrieved 2016-05-23.